IN A RECENT ARTICLE FEATURING ALEXANDRA DAISY GINSBERG’S SYNTHETIC KINGDOM PROJECT, HETTIE JUDAH ASKED, “WOULD PEOPLE STILL BE SCARED OF NANOTECHNOLOGY IF WE COULD MAKE IT STRAWBERRY FLAVOURED?” IN SOME WAYS THE ARTWORKS IN LIFE 2.0: ARTIFICE TO SYNTHESIS ARE SO SUBTLE THAT THEY DON’T NEED SWEETENING. NEW TECHNOLOGIES SLIDE INTO OUR LIVES IN SUCH AN INNOCUOUS MANNER THAT THE TECHNOLOGIES DISCUSSED IN THIS EXHIBITION SEEM TO BE ALREADY NORMALISED. Much of the exhibition is couched in scientific-utopian terms which, on the surface, could be read as advertisements for synthetic engineering. The exhibition conjures an intense fascination for what we have done and can still do with synthetic life. There is only a slight feeling of discomfort about some of the proposed uses—a subtle twinge, miniature, like the subject matter of most of the artworks. Some of the concepts that the exhibition asks the viewer to consider are not too far away from what people are already doing. If we can breed a sheep just for the purpose of shearing it, then why can’t we use the same sheep to provide dialysis for a human? Is one ‘use’ of the animal more humane than the other? If we use animals for our entertainment (pets, racing) or manufacture them for our food, why not use them as medical aids? Revital Cohen’s Life Support: Respiratory Dog and Dialysis Sheep proposes using retired working animals in medical programs, producing a symbiotic relationship between animal and patient. A lamb lies down on a bed of hay next to a sleeping man; the image is beautiful, softly lit and sensuous. Both man and lamb are connected to a dialysis machine, blood is feeding out of the man into the lamb, waste is processed by the lamb’s kidneys, a natural cleaning system, and eliminated through the lamb’s urine. Healthy blood flows back into the man. During the day the lamb is free to graze in the backyard and at night, while it sleeps, it is put to work. 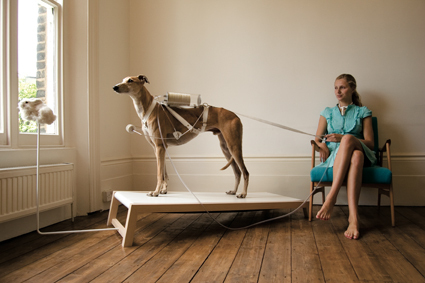 In a kind of chimerical/cyborg configuration, human, machine and animal come together and produce what curator Melinda Rackham describes as an emotionally and physically intimate healing relationship. Two of Cohen’s four photographs of Dialysis Sheep and Respiratory Dog are in everyday picture frames—taking the concepts further into the domestic arena—but are we ready to be so emotionally and physically (even parasitically) dependent on animals? Alexandra Daisy Ginsberg’s individual artworks and collaborations dominate the exhibition space. The Synthetic Kingdom: Synthetic Pathologies features beautiful luminescent photographs: Bioluminescent Kidney Stones, CMYK Plaque (on a set of teeth), Pollution-sensing Tumour Lung and Colonic Alchemy (gold faeces), with each body part showing anomalies formed by the body’s exposure to synthetic bacteria that have accidentally escaped from laboratories, factories and broken products. In this fictitious scenario, some of the bacteria have evolved, changing their function as they proliferate. Each image comes with a back story, such as Colonic Alchemy, where a patient’s waste material is turned to gold—although genetic testing failed to find the origins of the bacteria that caused this precipitation. These stories are almost believable; I found myself questioning whether this had already happened somewhere. Ginsberg plays with the fear of invasion/infection by our last ‘other,’ ie bacteria, with the alchemists’ quest finally answered by something that we have made, but cannot quite control. In The Synthetic Kingdom: A Natural History of the Synthetic Future, exhibited as an animated video and as a diagram, Ginsberg explores the need to add a new branch to the Tree of Life—Synthetica. She asks, “How do we classify natural and unnatural if life is built from scratch?” The animation explores the way that life can be built from existing DNA rather than from petrochemicals. In E.chromi, collaborating with James King and the Cambridge University International Genetically Engineered Machine (iGEM) team, Ginsberg explores how the team constructed bio-bricks, synthetic genes which, when inserted into the bacteria E.coli began to secrete colours visible to the naked eye. The animation projects future uses for these bacteria: by 2039 they could be used to make a yoghurt drink which changes the colour of waste to indicate the presence of specific diseases in the body. A physical example of this is also exhibited as The Scatalog, a case of brightly coloured stool samples, each colour indicating a different disease. The animation also suggests that in the future a new profession will be created, with people searching the world for DNA that produces certain colours. Colour swatches are shown alongside a whale and a canary, perhaps suggesting that synthetic manufacture will not quite be able to stop the plundering of the natural world. The two artworks by Richard Pell, from the Centre for Postnatural History, provide captivating catalogues of genetic research. A Selection of Noteworthy Genetically Engineered Bacteria, 2011-05-17, a cabinet of curiosities, features ‘highlights’ from the world of miniature synthetic life. Two samples that stand out are the Olfactory Art Bacteria, engineered in Bangalore India to produce the smell of fresh rain at the start of the monsoon season (why has this not been sold commercially?) and the GenTerra bacteria used by the Critical Art Ensemble, which was seized by the FBI in a mismanaged bioterrorism investigation. GenTerra was used in a performance that implicated the audience by giving them permission to release samples of bacteria into the atmosphere, one of which was possibly synthetically manufactured. These samples are fascinating as a catalogue of what can be done with genetic engineering—the presence of Gen Terra along with the sealed case that the samples are presented in is a reminder of the responsibility that accompanies this desire to tinker with the world. Pell’s Strategies in Genetic Copy Prevention looks at techniques that are used to control life, such as sterilising insects that were damaging the cattle industry in the United States and, on a more sinister note, sterilising humans (those considered to be criminal, idiots and rapists) in a plan passed in Indiana in 1907, a practice that died out after World War II. This is another reminder of the implications of these new technologies, beyond fashion and politics. Deborah Kelly’s animation Beastliness is part of her ongoing exploration into the poetics of biotechnology. The animation features hand-cut chimerical creatures made of human, animal and plant parts dancing seductively together in a crazy mating ritual. Kelly writes, “The horizonless, post-species-specific possibilities of our new on- and offline lives demand sustained investigation as we tango into the far-fetched future, propelled by unchecked hungers.” In some ways, Life 2.0 is very clean and sanitised—if it weren’t for the uproarious music of Beastliness, inserted between the soothing pseudo-scientific soundtracks of Ginsberg’s animations, desire in all its messiness might not enter the gallery space. Kelly’s animation actively injects a little of the dystopian into the utopian future of manufactured scientific endeavour, moreso than some of the more subtle works in the exhibition. Beastliness leaves us with the question: what should we fear and what should we celebrate? It’s a question that bypasses the need for sugarcoating.